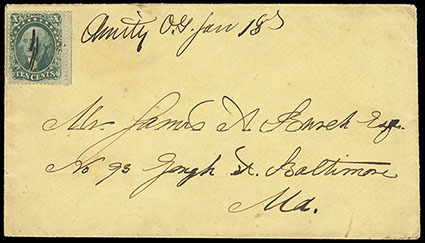 Amity, O.T., Jan. 18, manuscript postmark on yellow cover to Maryland franked with manuscript cancelled 1857 10¢ green, type II, flap torn, Very Fine and rare, ex-Jarrett. Astoria, Orgn. Apr 26, early type cds (Whittlesey #2, R C) and manuscript "Paid 6" rating on 1852 folded letter datelined "Clatsop Co. O.T. April the 22 52" to Newark Mo. ; some staining and folds reinforced, Fine and scarce. 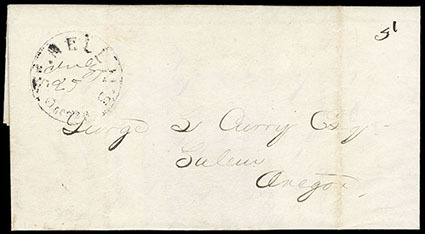 Oregon City, Org., Nov. 14 ("14" inverted) folded cover to Salem with "5" rate handstamp, F.-V.F., business accounting letter from the former Hudson's Bay Company Chief Factor to Alanson Beers in Salem. Beers had arrived in 1837 and was a key player in the Provisional Government of 1843. A wonderful historical piece. 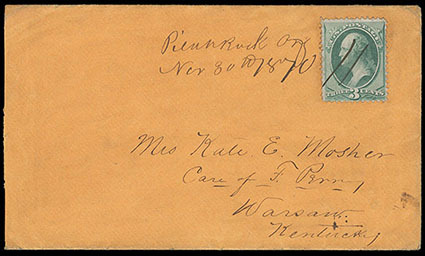 Pilot Rock, Org., Nov. 30, 1870, manuscript postmark on cover to Kentucky franked with manuscript cancel 3¢ Bank Note, manuscript cancelled, slightly reduced at left, Very Fine, Earliest known use (by 4 years) from this town and second reported manuscript cancel. Portland, OT, Mar. 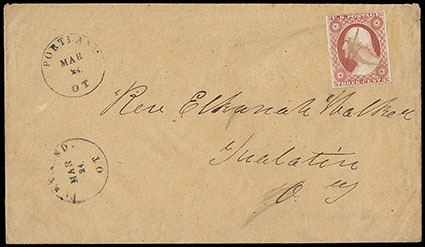 24, two nice strikes on small cds on cover franked with manuscript cancelled 1851 3¢ dull red to Tualatin, OT, addressed to Missionary Elkanah Walker, Very Fine and attractive. A rare example of Portland's first handstamp. About six covers are recorded with this locally produced device, which used in late 1851 and early 1852. 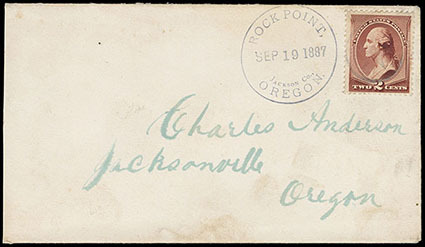 Rock Point, Oregon, Jackson Co., Sep. 19, 1887, town & county postmark in violet on cover to Jacksonville, Ore. franked with 2¢ Bank Note cancelled by fancy star cancel, Extremely Fine. 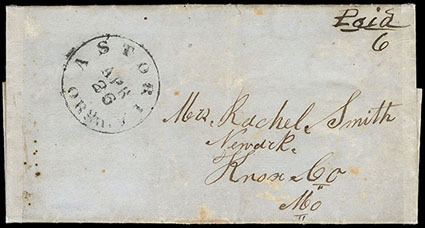 St. Helens, Oregon, July 25, cds with manuscript date on 1853 folded letter with manuscript "5" collect rate from Thomas Smith headed "Milton" to Gov. Curry in Salem about power of attorney to collect Cayuse War claims for Nathaniel Crosby, two vert. file folds, F.-V.F., rare example of first St. Helens handstamp. The Cayuse War was an armed conflict that took place in the Northwestern United States from 1847 to 1855 between the Cayuse people of the region and the United States Government and local American settlers. Caused in part by the influx of disease and settlers to the region, the immediate start of the conflict occurred in 1847 when the Whitman Massacre took place at the Whitman Mission near present day Walla Walla, Washington when fourteen people were killed in and around the mission. Over the next few years the Provisional Government of Oregon and later the United States Army battled the Indians east of the Cascades. This was the first of several wars between the Indians and American settlers in that region that would lead to the negotiations between the United States and Indians of the Columbia Plateau, creating a number of Indian reservations. (St. Helens, Oregon), blue embossed cameo corner-card for "B.M. 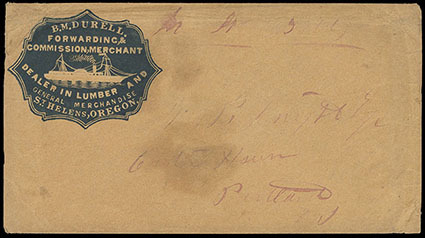 Durell, Forwarding & Commission Merchant, St. Helens, Oregon" on cover addressed to Portland O.T., apparently carried by ship outside the mail, F.-V.F., This is the only early cameo corner-card seen from Oregon Territory.